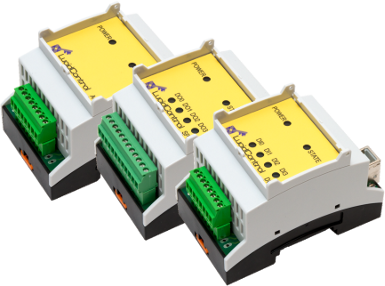 The reliable and industrial ready output modules provide professional terminal connectors and are mountable on DIN-Rails which makes it easy to integrate them into switch cabinets in the factory as well as at home. 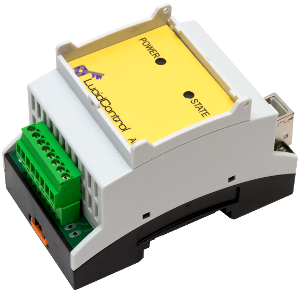 Beside of many other models, the LucidControl product family provides 3 different types of output configurations and covers most applications. This section explains the characteristic of the 3 different output types and should help making a decision, which of the options is the right one. One typical application is to control power loads and switching them on or off as well as controlling their power by pulse-width-modulation. The best way to do this is by using the DO4-I module shown in the picture beside which employs Solid State Relays (SSR). These relays, based on semiconductor technology, allow to switch power consumers periodically and relatively fast on and off which allows for example to control the flow of fluids through a pump. Whenever the relay is closed, the pump runs and carries fluids, during the off period the pump stops and of course no fluids are transported during this time. 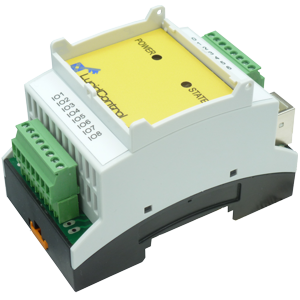 The LucidControl DO4-I Digital Output Module employs Solid State Relays and is able to handle power loads rated with max. 30V DC and 0.75A (22.5 Watts). If main power should be controlled, the Solid State Relays of the DO4-I Module can be used in order to control external relays which are able to switch higher voltages like 230V. Solid State Relays give the best overall performance and have the highest protection level because of the optical isolation between computer and power load, but they can only be used for electrical power consumers. All terminals are completely independent and are potential free which means than they are not related to any potential of the module itself as e.g. a common ground would be. Additionally, the polarity of the voltage applied to the terminals is not relevant and the switches works in forward and reverse connection. 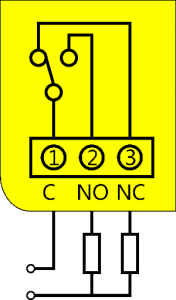 Mechanical relays used in the DO4-S Module on the opposite consist real switch contacts which close an electrical circuit. Beside of switching power loads mechanical relays can also be used for switching of (measurement) signals without distortion. When, for example two temperature sensors should be alternatively connected to a measurement device, this can be realized by the a DO4-S module. 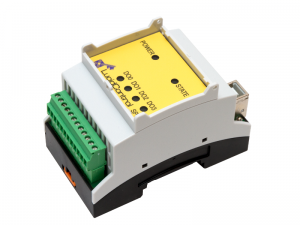 The picture shows that the DO4-S module has a 12 pin IO-Connector instead of the 8 pin IO-Connector used in the other modules. The 12 pins are needed because each output channel is carried out as C-Type Single Pole Double Throw (SPDT) and provides 3 isolated and potential free terminals where the common contact is toggled between the normally opened (NO) and the normally closed (NC) contact. 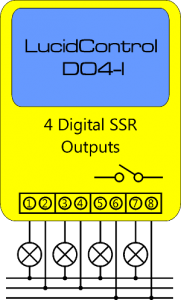 Compared to the DO4-I module, the DO4-S module is also able to select one out of two lines allowing e.g. to toggle between two measurement signals. On the other hand, mechanical relays have the disadvantage that the number of total switch cycles is limited by the mechanical contacts. 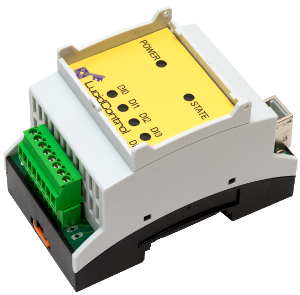 Mechanical relays should not be used when a cyclic and continuous switching over a long period is necessary in order to avoid wear out of the mechanical contacts. 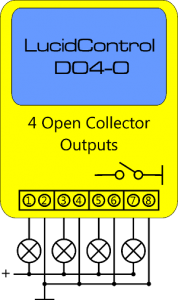 The third way, digital outputs can be made of is by using Open Collector outputs. They are similar to Solid State Relays but can be used for faster switching cycles (shorter than 1 milli second) by using transistors connecting a terminal to ground. Fast signal transitions are e.g. required when LEDs should be dimmed without flickering, creating a specific lightning scenario. 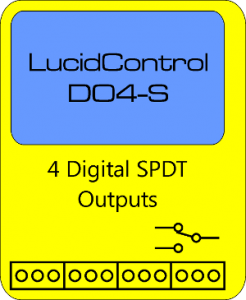 In contradiction to the other modules all output channels of the the DO4-O module are not isulated and have a common ground which is also shared by the module and the connected computer. 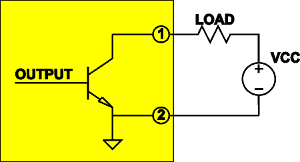 The disadvantage of the missing isolation which is present in both other output types makes the DO4-O only the best solution if they are not appropriate due to the timing reasons.